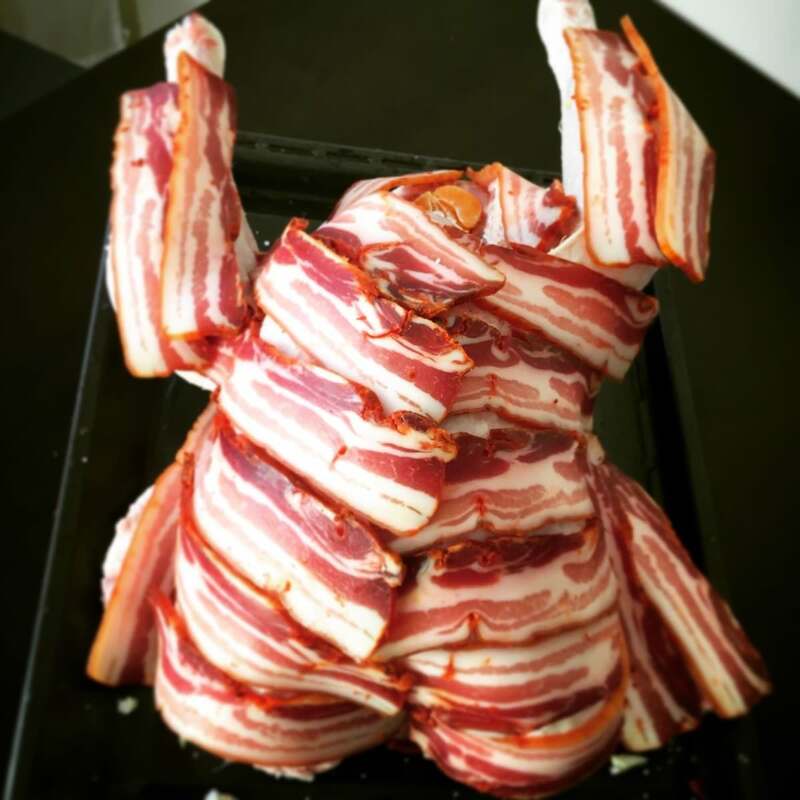 Step 1: Wrap turkey in bacon. United Mint Campus Thanksgiving Turkeys get bacon wrapped for bakin’. Step 2: Check on turkey periodically. Step 2.1: Add more bacon. One bacon dress is not enough to make it through the hours of cooking, so you must add bacon as the Turkey cooks. 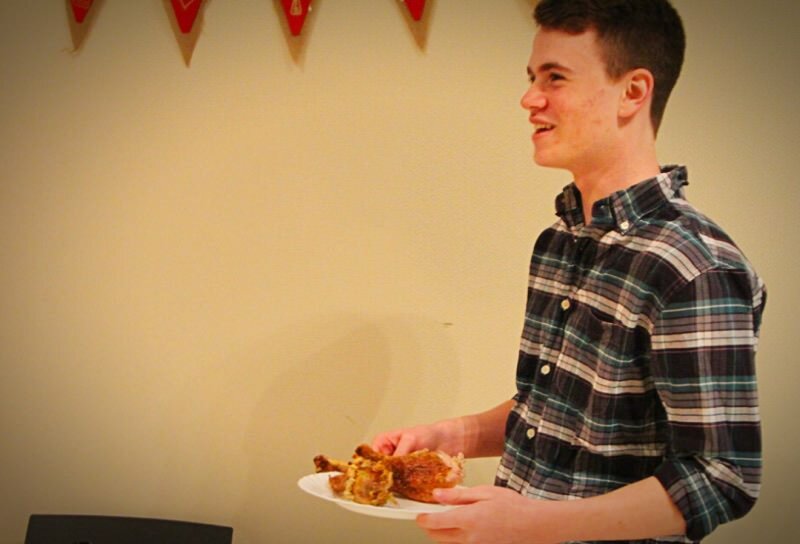 Bonus: you get a plate of bacon as a dish on the Thanksgiving table. 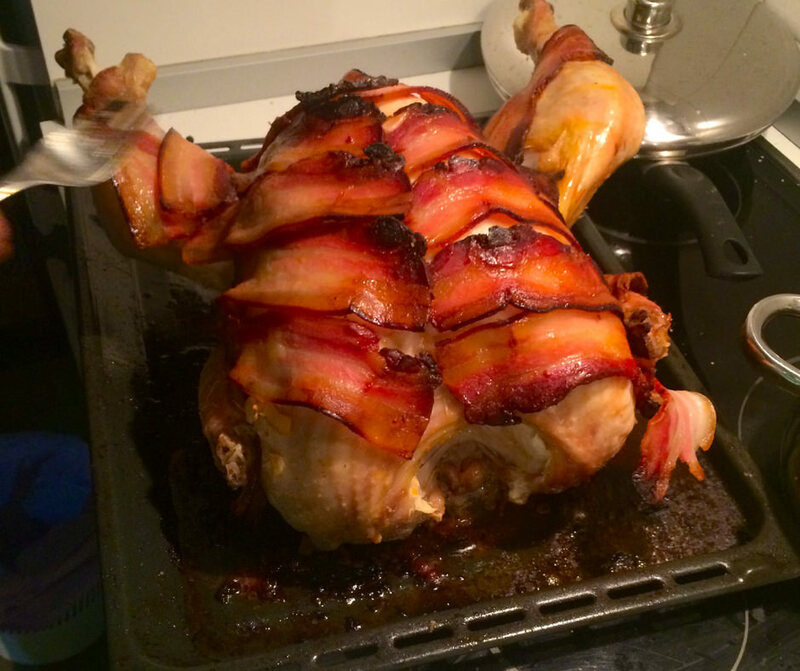 Honestly, there are very few things better looking than a turkey wrapped in bacon. Step 3: Remove from the oven. Here’s where the fun came in. Remember when I said we were using 2 kitchens? Our head chef was in the other kitchen when I heard the Turkey timer go off. So, I grabbed the nearest rags and tried to pull the 20 pound turkey (with a few extra bacon pounds) out of the oven, not expecting the grease, heat, and gravity to sabotage the operation. It was a close call. Thankfully, all my trips to the gym finally paid off. But, I am planning to start a tradition of scaring the hell out of whoever’s making the turkey by “almost” dropping it in the oven. 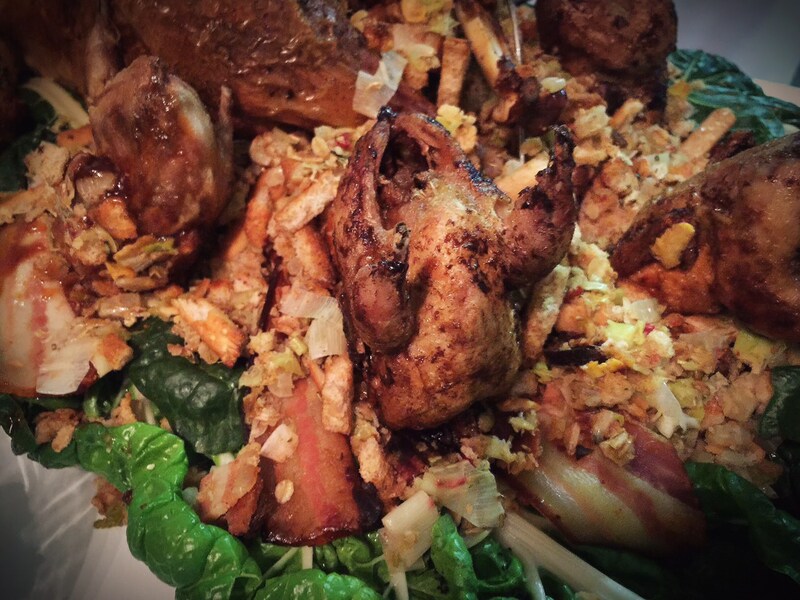 Eat everything: bacon, stuffing, drumsticks, but pay special attention to the crispy skin. Even with all the cooking experience I had been racking up before Thanksgiving day, I discovered that my yam-slicing skills were subpar. I was put on yam slicing duty. The dish required a layer of yams, then a layer of Idiazabal cheese, then another layer of yams, then another layer of a strong cheese, and repeated for a few layers, finally topped with cheddar. Chef Toly played the role of a slightly more forgiving Gordon Ramsey with my yam-cutting abilities, but ultimately I think his strict adherence to technique was useful. I’d like to believe that my average thickness per slice decreased by about 200% by the end of this exercise. My lovely Thanksgiving plate. The yam dish is on the left, with the many cheeses melted on it. 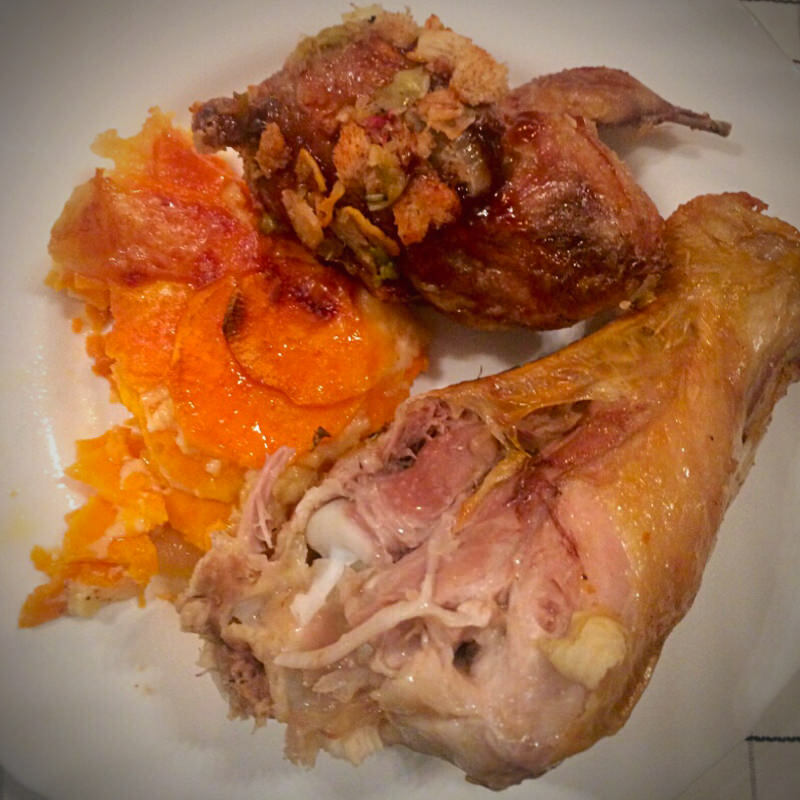 On the right is a Turkey leg and the quail, which had stuffing stuck to it. When I first saw the uncooked quail, they actually looked like the most adorable things. Sitting next to the turkey, they looked like one big happy family. It was quite an adventure figuring out how to properly deep fry the birds, since we had no thermometer to check if the oil was ready. We had to find all sorts of life hacks in order to make sure the oil was hot enough (the winner: dipping a wooden spoon in the oil; if the oil bubbled, then it was hot enough). The deep fried quail itself was delicious (drenched in bbq sauce, of course) and I would love for it to be an addition at my next year’s Thanksgiving. That’s my second helping of turkey. Because of me, there are 2 fewer quail in the world. Those little birds were delicious. David Szanto is learn/work/playing via adventures in Spain, Australia, and New Zealand before he starts Harvard in Fall 2017. While at UMC, David is single-handedly creating an FPS video game, using Sketchup Pro for level design, Blender for character design, and Unity for game creation. He is also picking up some sweet knife skills.